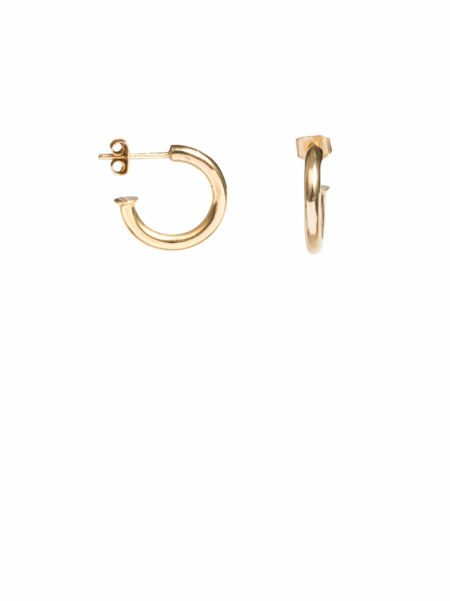 Home / Shop / New Products! Just one word....Chic! 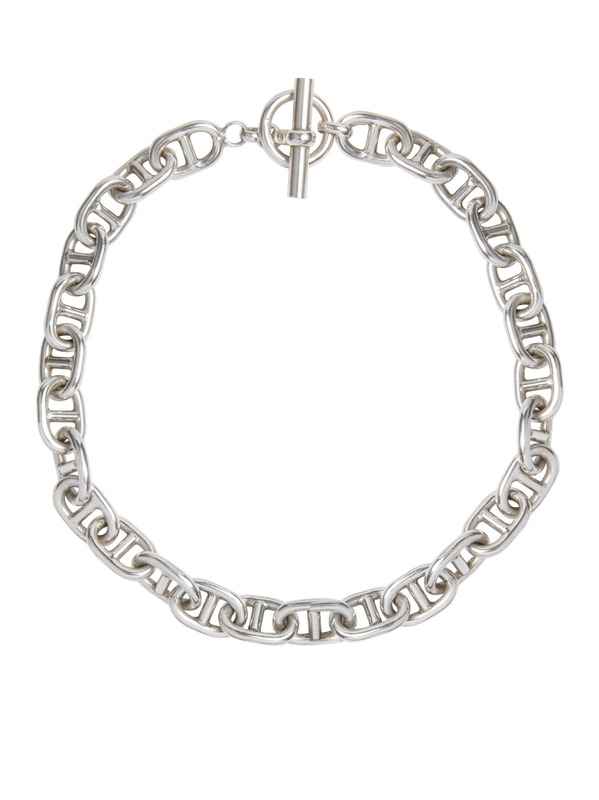 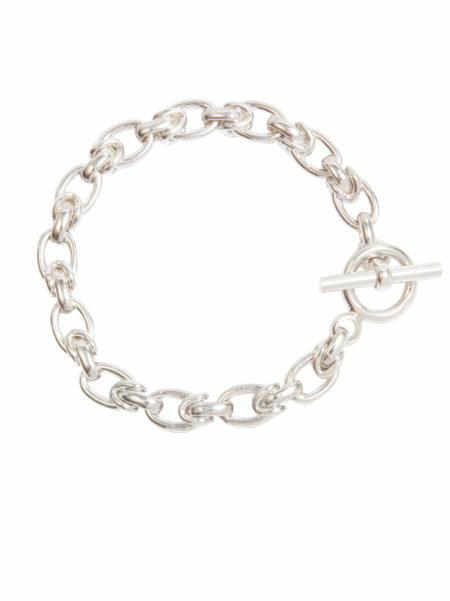 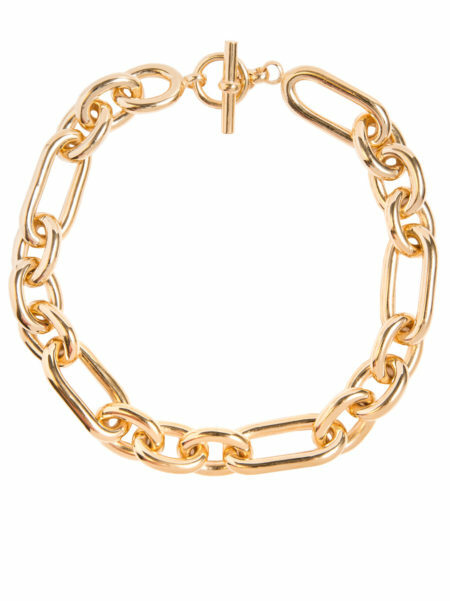 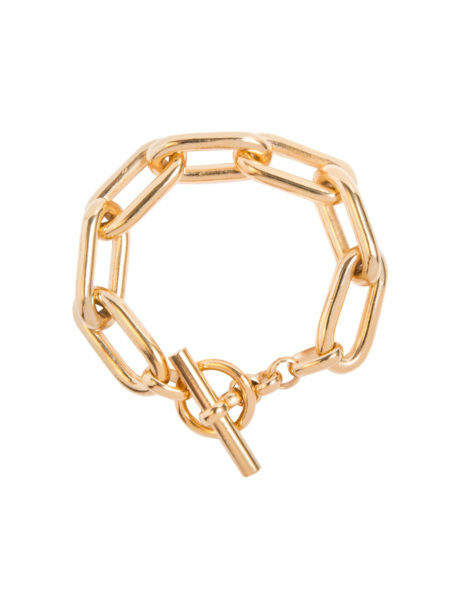 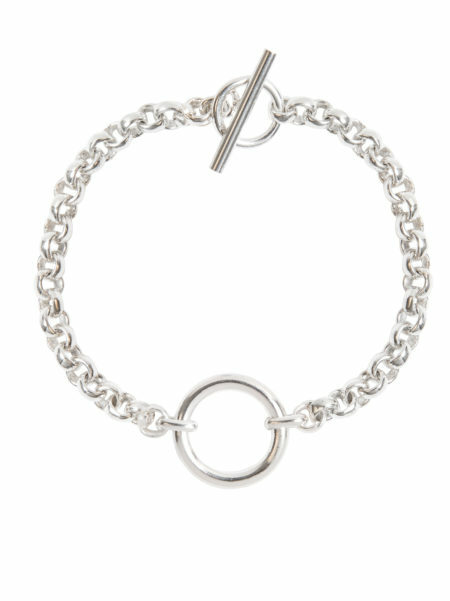 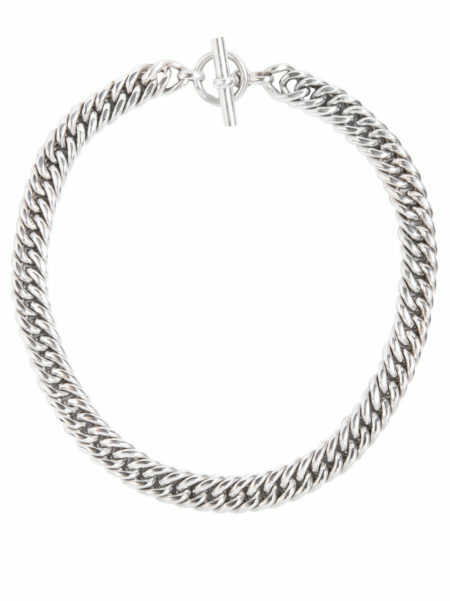 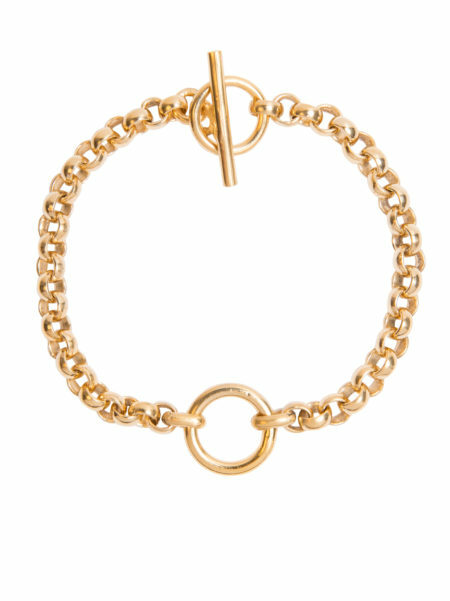 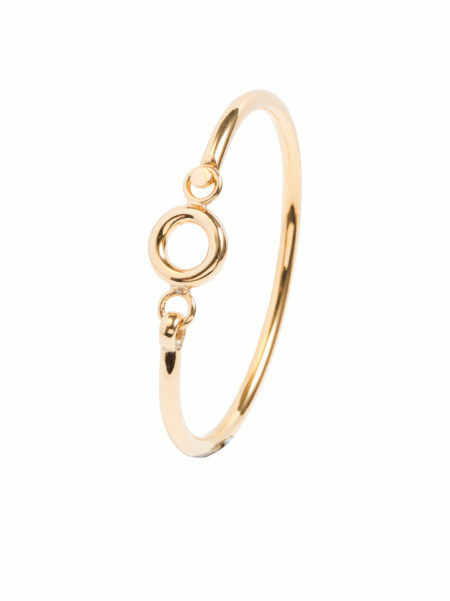 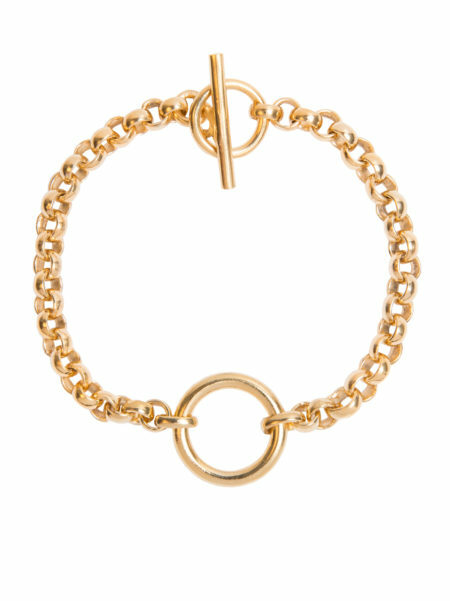 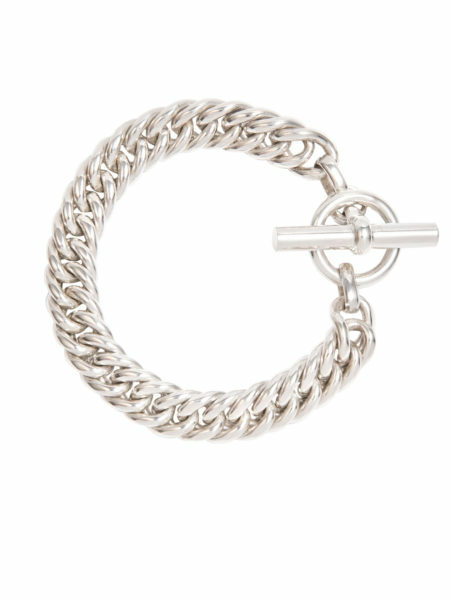 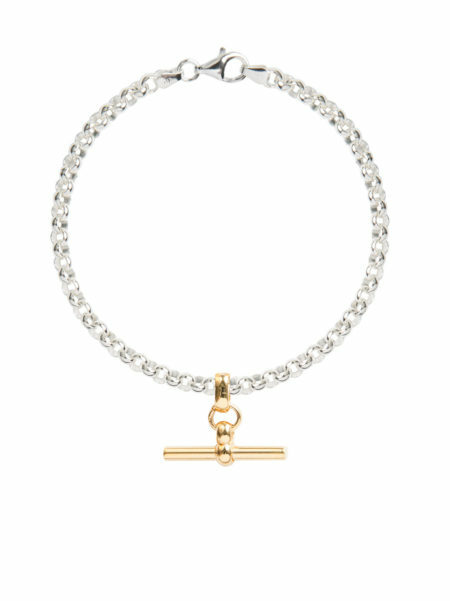 We are in love with this elegant linked bracelet. 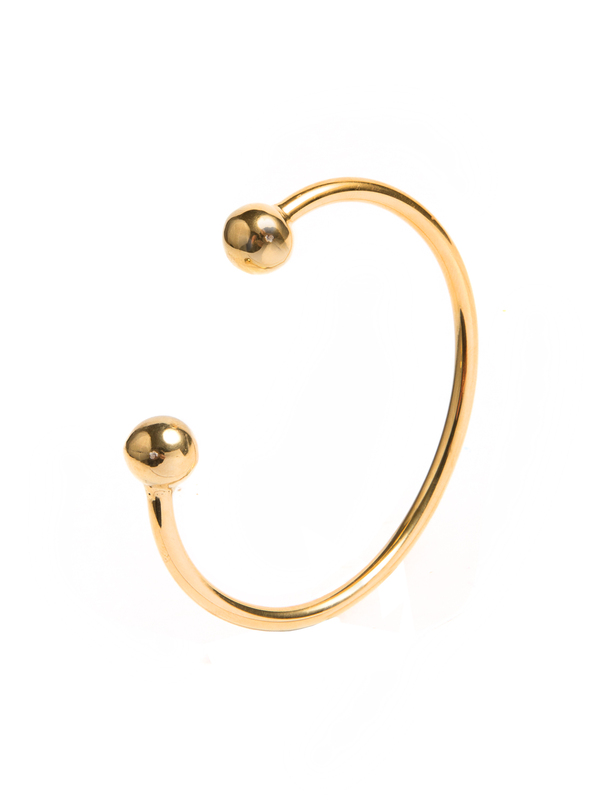 Its hand made in bronze and then gold plated with 2 microns of 18ct gold in Birmingham. 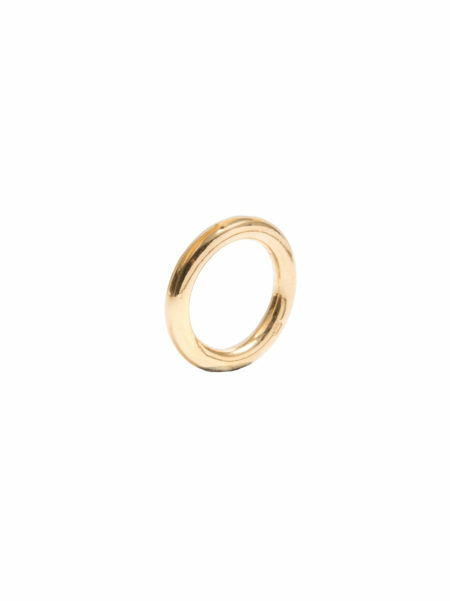 The quality of the workmanship is second to none and we offer a 1 year guarantee for the plating. 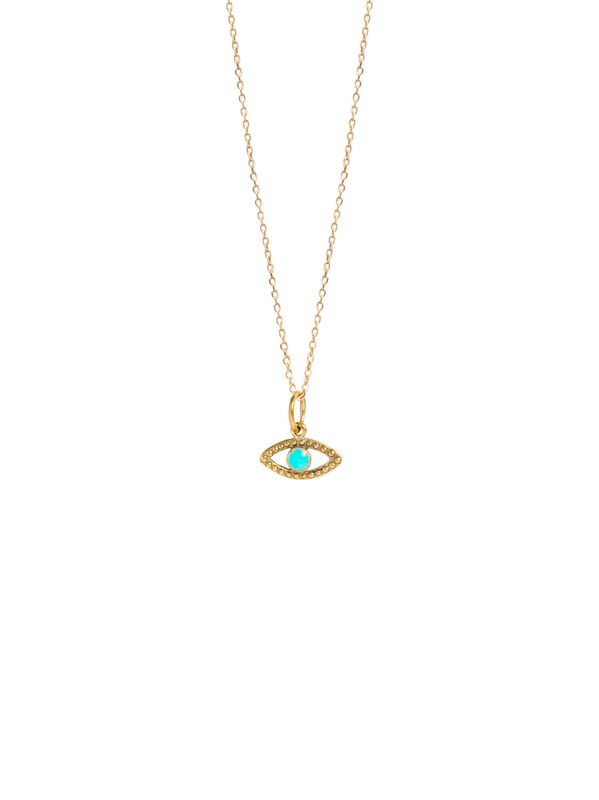 Obviously we advise avoiding all contact with water and perfume. 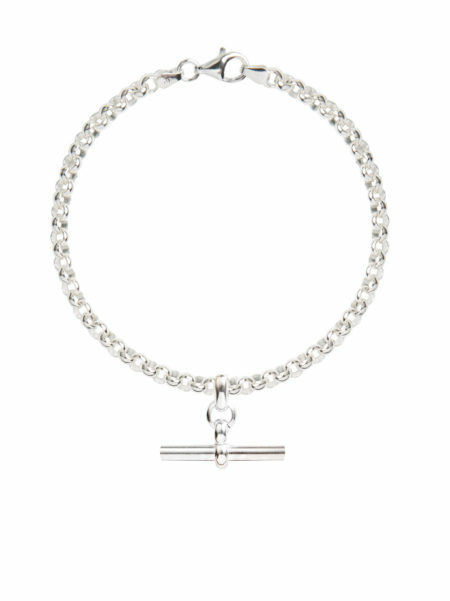 The bracelet measures 20cm in length and 1.5cm in width These bracelets are currently for pre order only and lead times are four to six weeks. 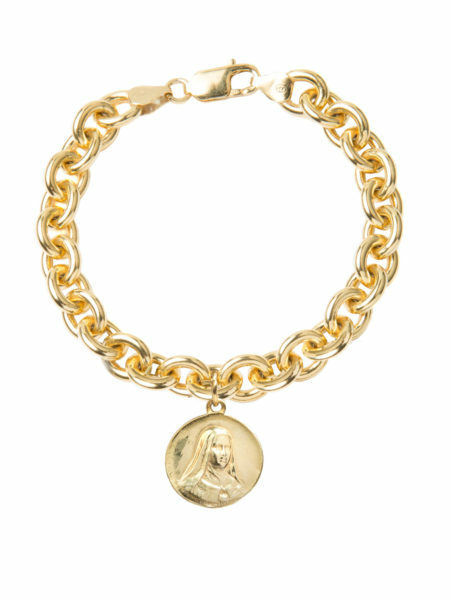 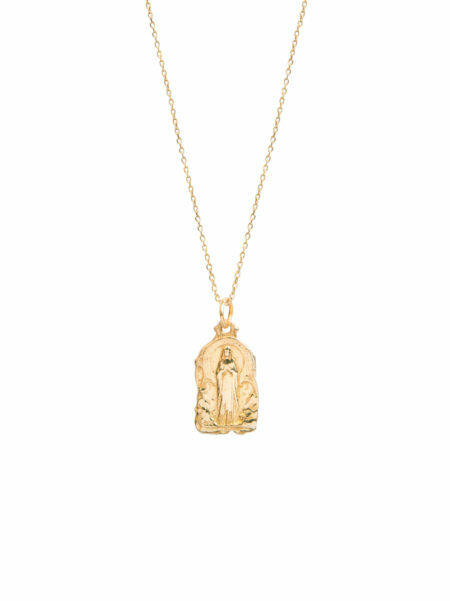 A timeless and classic, gold plated Virgin Mary necklace to bring some spiritual calm to the hustle of modern life. Wear on its own or team with other charm necklaces for an on-trend, layered look. 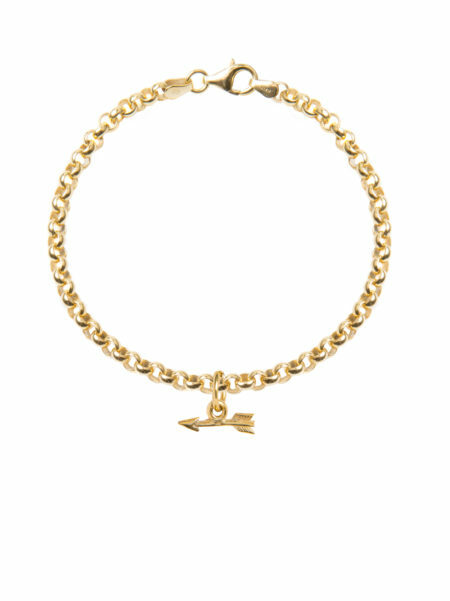 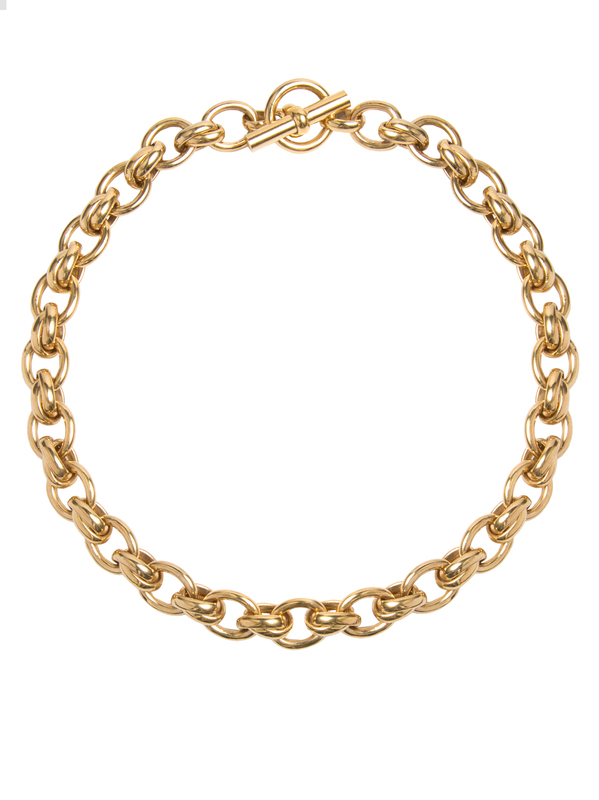 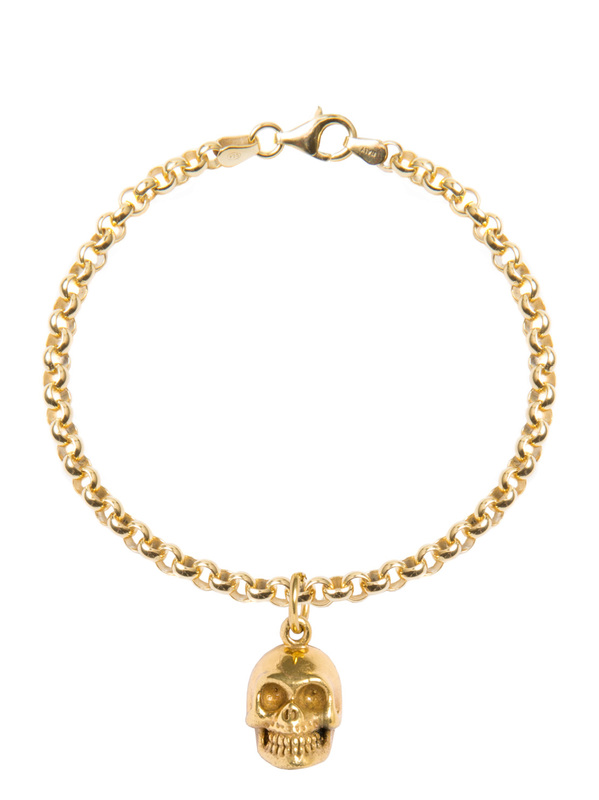 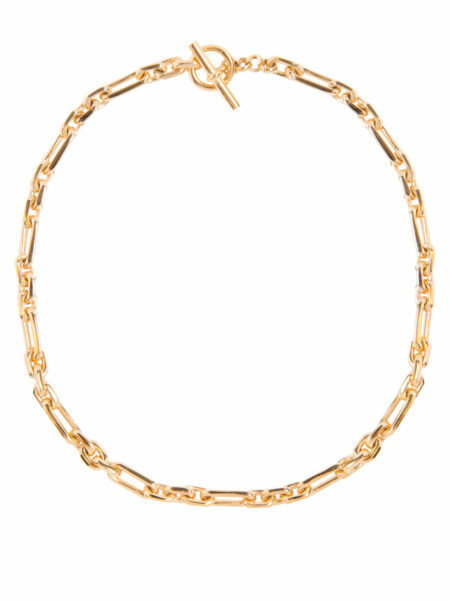 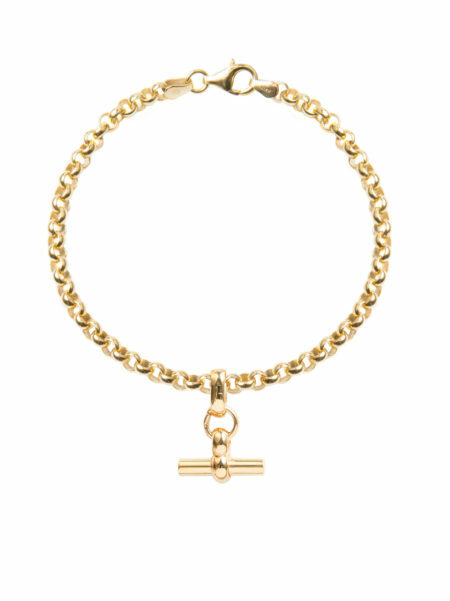 The gold plated, sterling silver chain is 60cms in length and the charm measures 2cm in diameter. An all time winner! 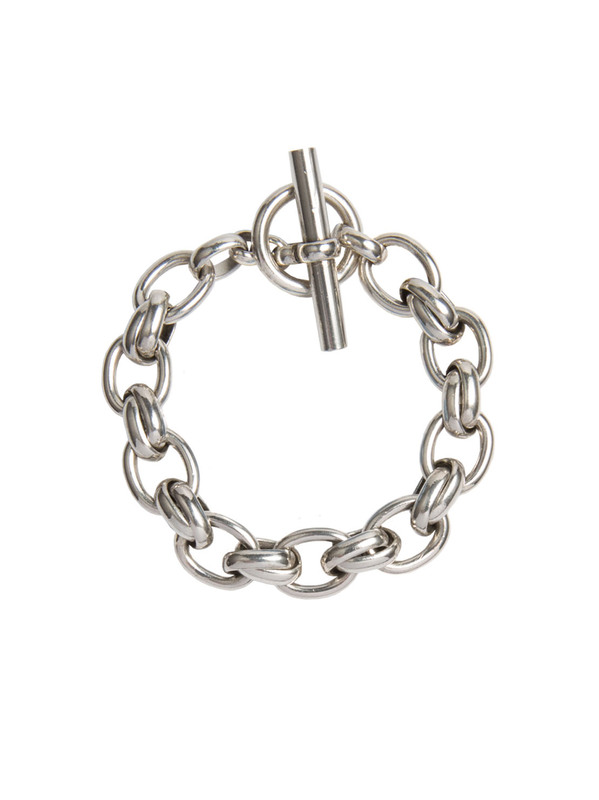 Perfect worn alone or a brilliant addition to any wrist stack. 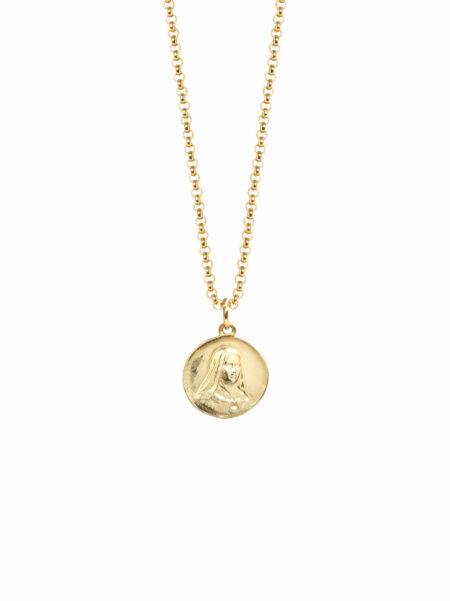 Its hand made in bronze and then gold plated with 2 microns of 18ct gold in Birmingham. 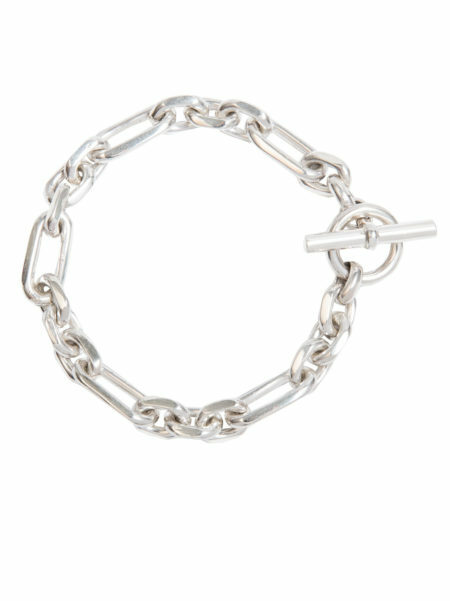 The quality of the workmanship is second to none and we offer a 1 year guarantee for the plating. 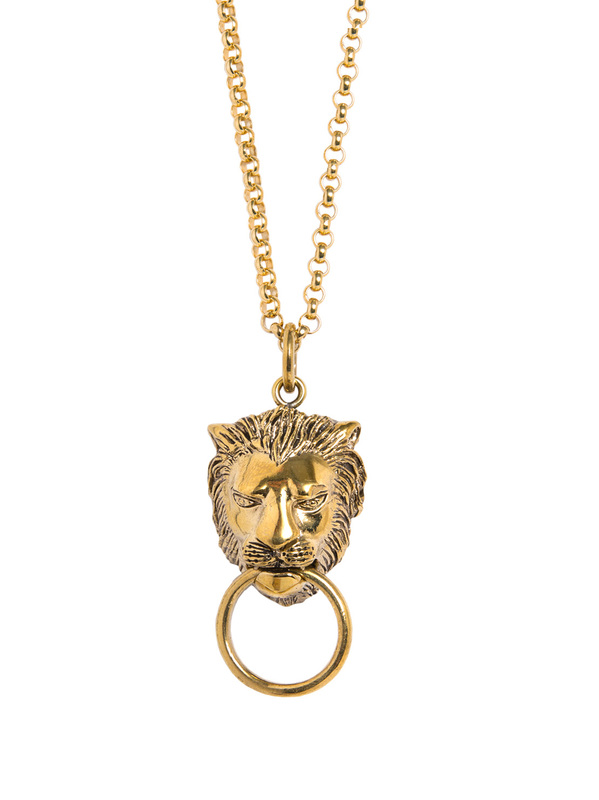 Obviously we advise avoiding all contact with water and perfume. 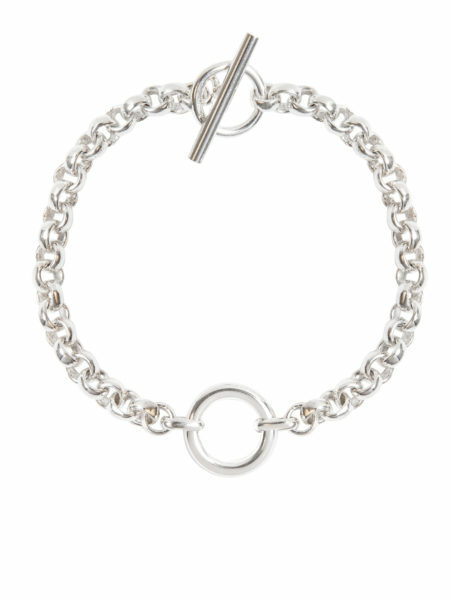 This bracelet is currently for pre order order only and lead times will be about four to six weeks. 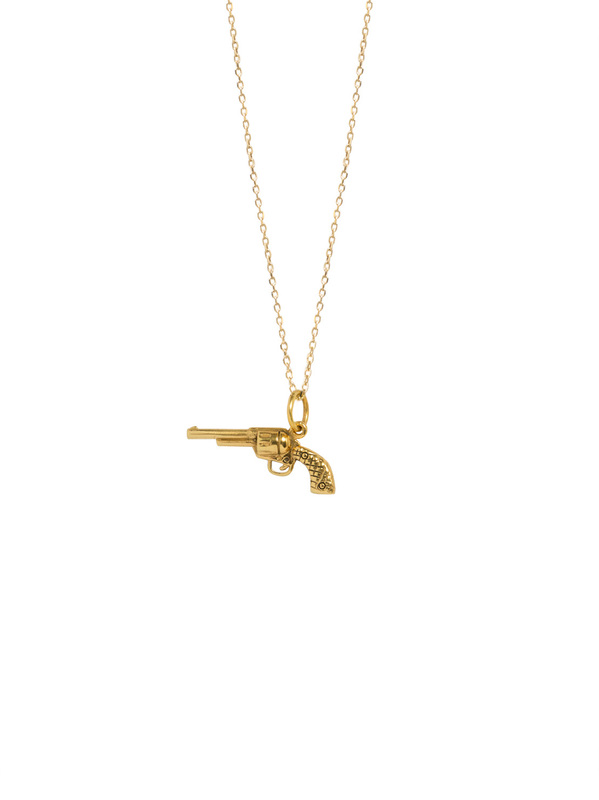 A truly awesome piece of jewellery! 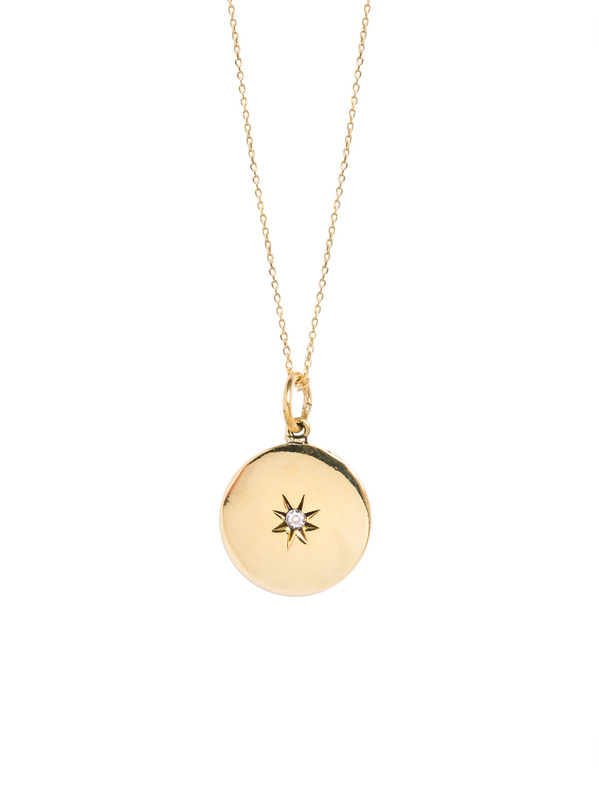 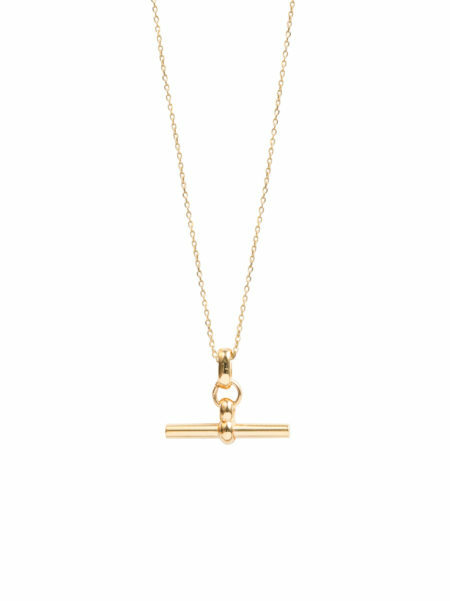 This necklace is a timeless piece that you can wear with anything, to exude style and attitude. 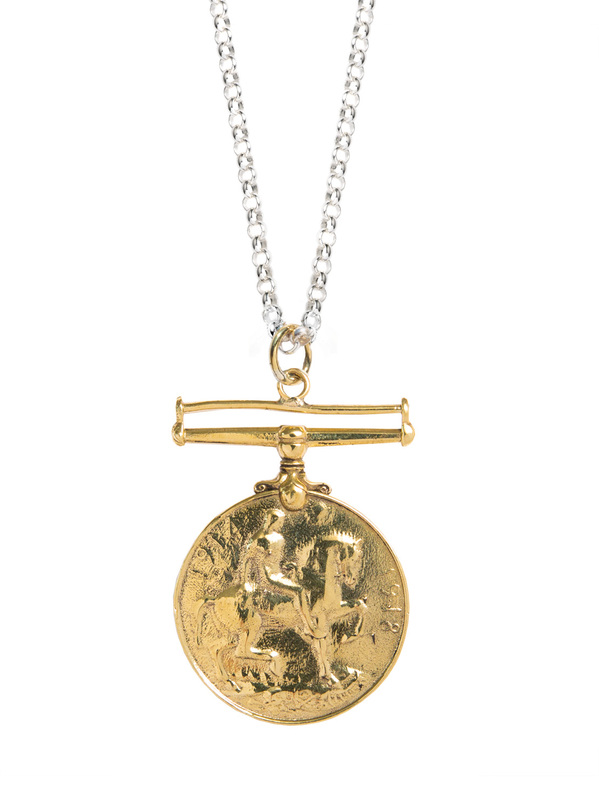 Its hand made in bronze and then gold plated with 2 microns of 18ct gold in Birmingham. 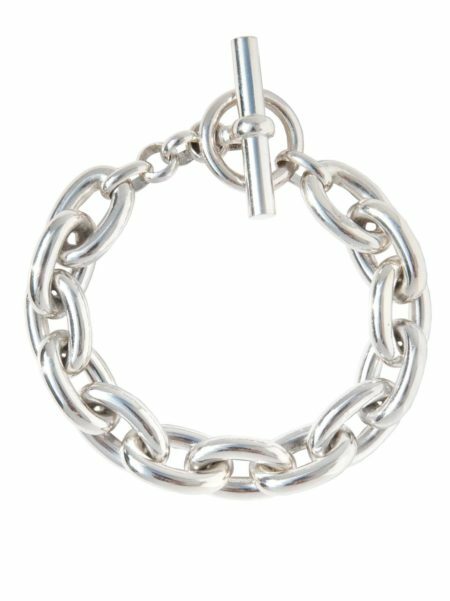 The quality of the workmanship is second to none and we offer a 2 year guarantee for the plating. 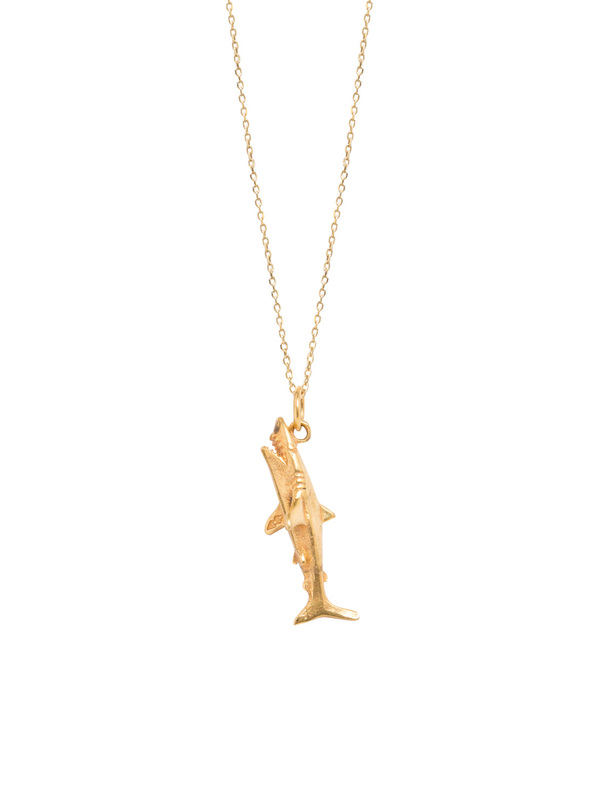 Obviously we advise avoiding all contact with water and perfume. 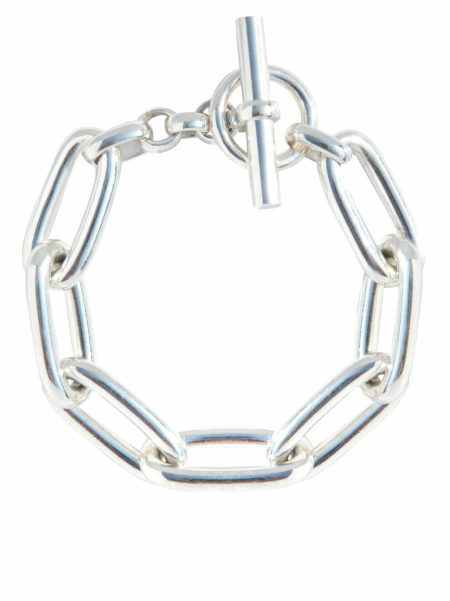 If the necklace is out of stock then lead times are about four to six weeks, We can also make them to any length so please get in touch to discuss your specific requirements. 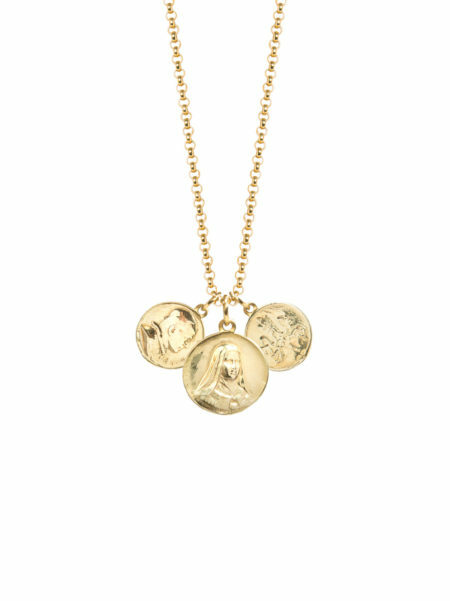 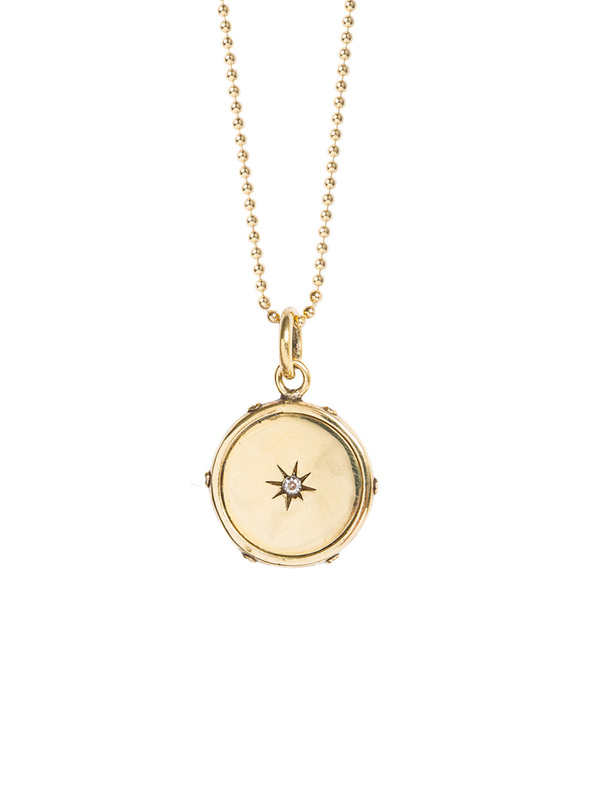 A vintage-inspired Pope pendant on a delicate trace chain. 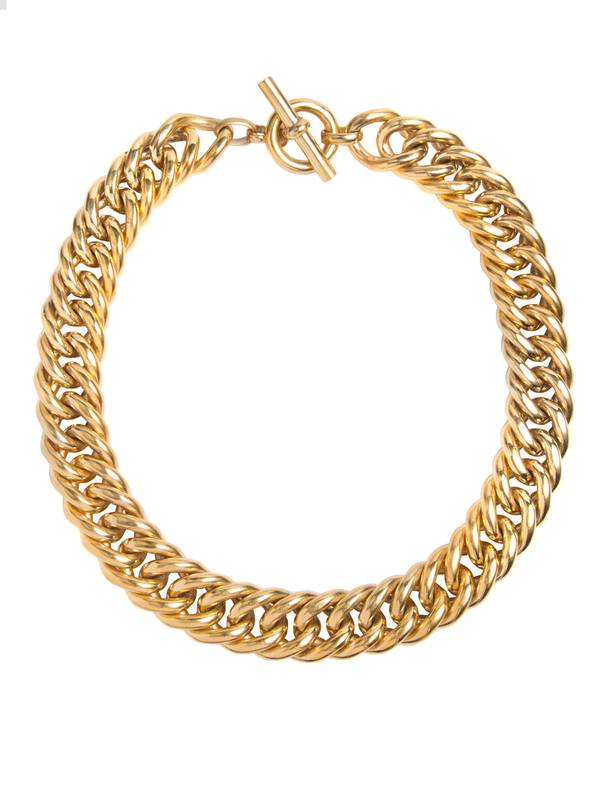 The chain has three interchangeable length options, so can be worn longer or shorter, from 40cms to 45cms or 50cms. 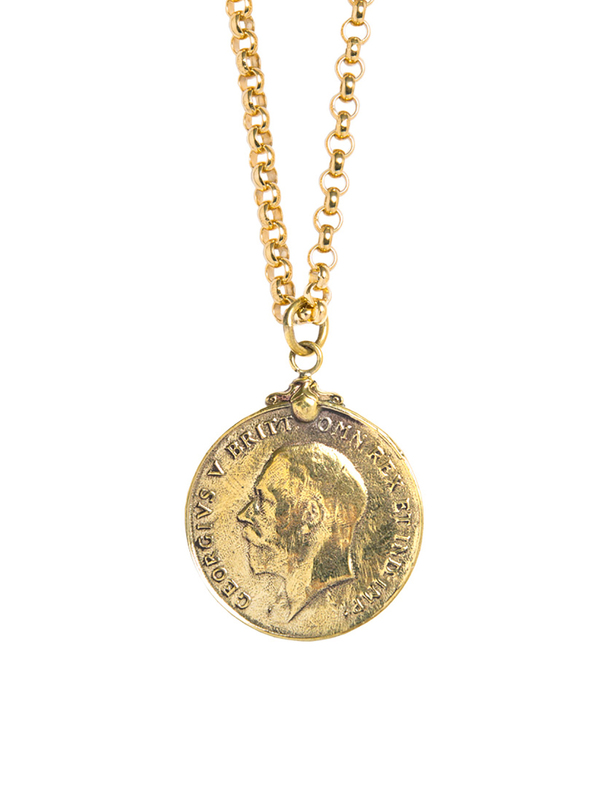 The coin is 1.5cms in diameter. 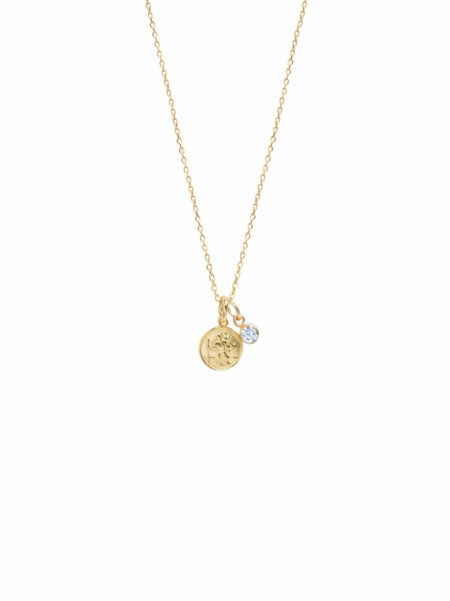 This twinkling Swarvoski crystal charm, elegantly hung on the finest, gold plated trace chain, will bring a hint of sparkle to any outfit. The perfect layering necklace too. Pendant measures 1cm in length including jump ring. 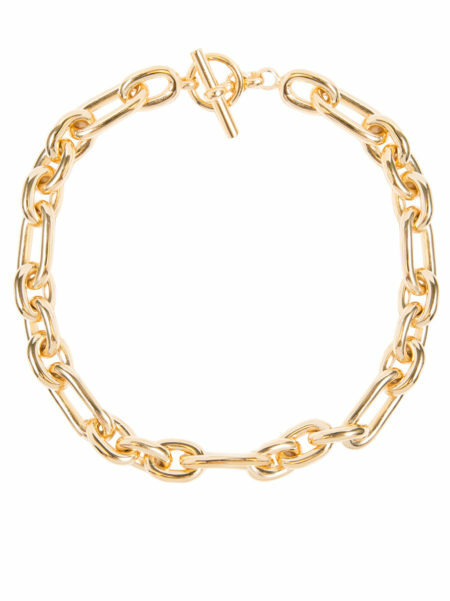 The chain has three interchangeable length options, so can be worn longer or shorter, from 40cms to 45cms or 50cms. 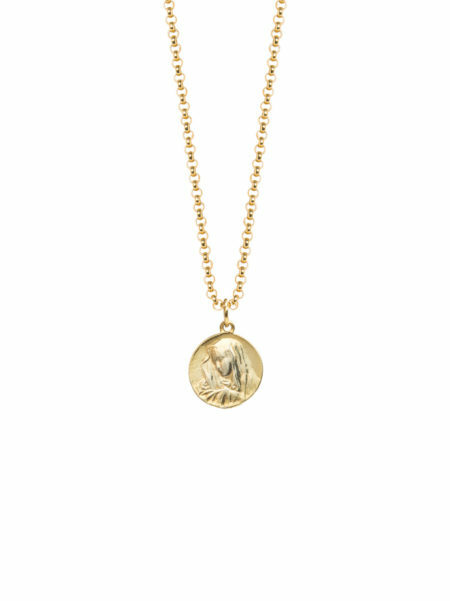 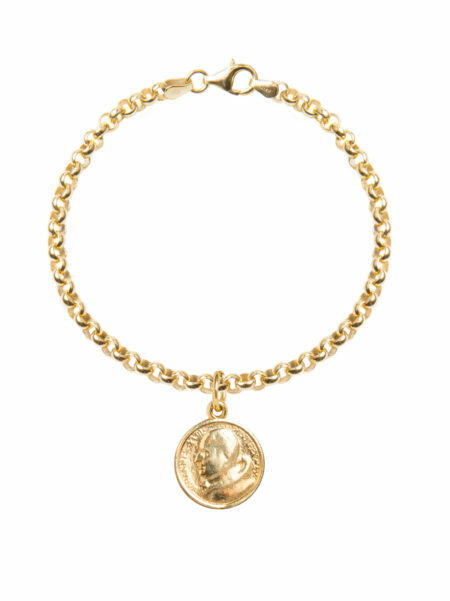 This absolutely adorable gold plated St Christopher measures 1cm in length and hangs alongside a white Swarovski crystal charm. The chain has three interchangeable length options, so can be worn longer or shorter, from 40cms to 45cms or 50cms. 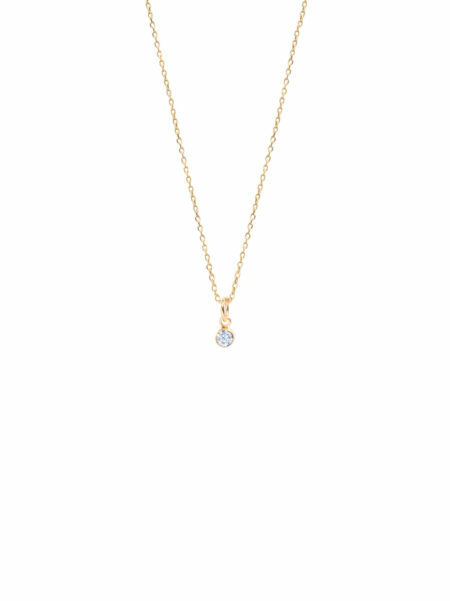 This layering combo makes us think of white washed buildings, blue skies, and tanned skin. 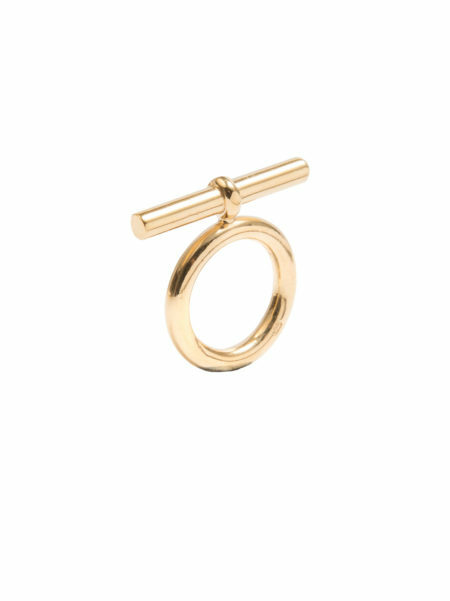 The perfect addition to any holiday wardrobe. 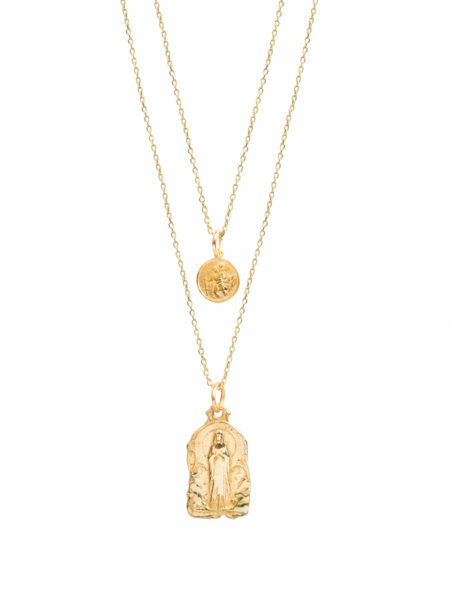 The tiny St Christopher measures 1cm in length and Our Lady measures 2cm in length. 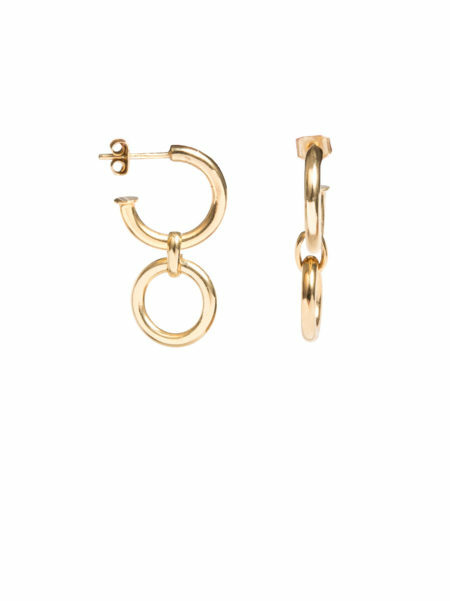 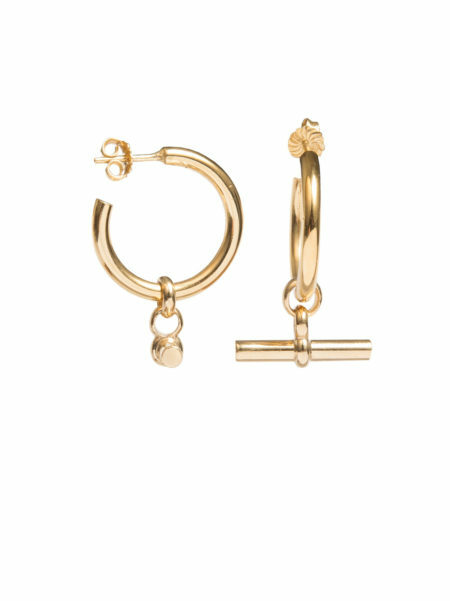 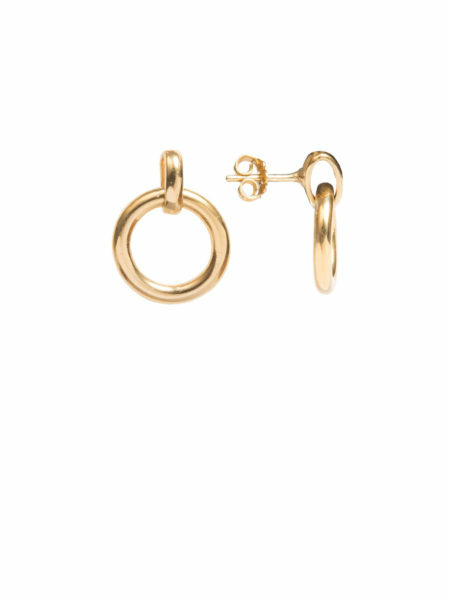 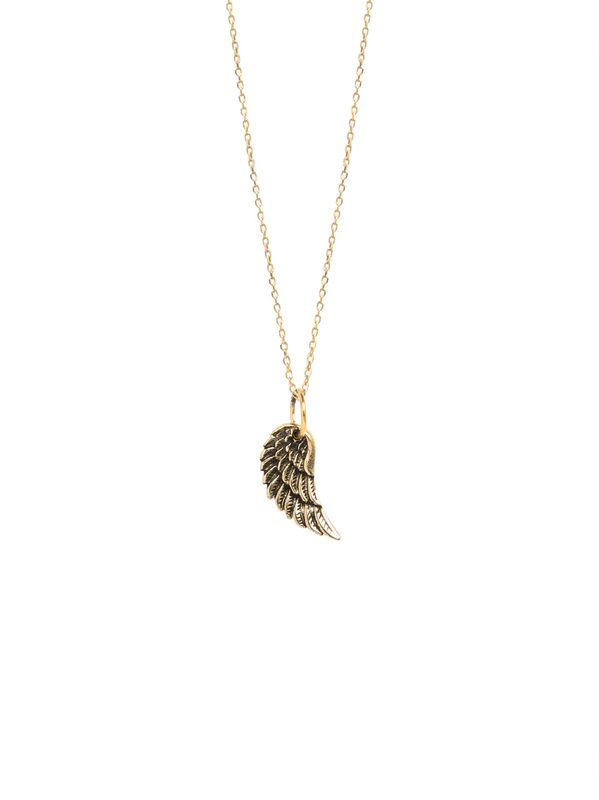 Both gold plated charms hang on trace chains. 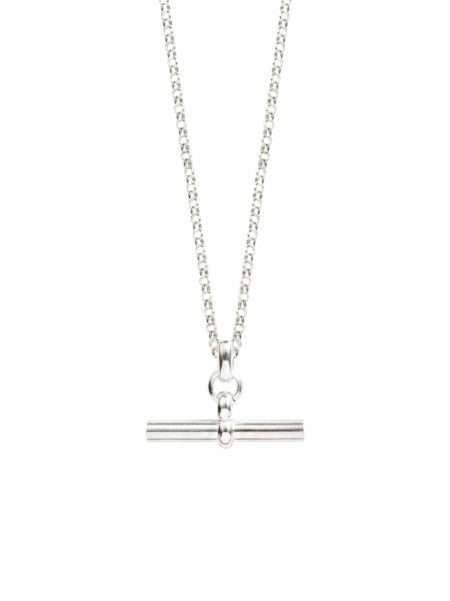 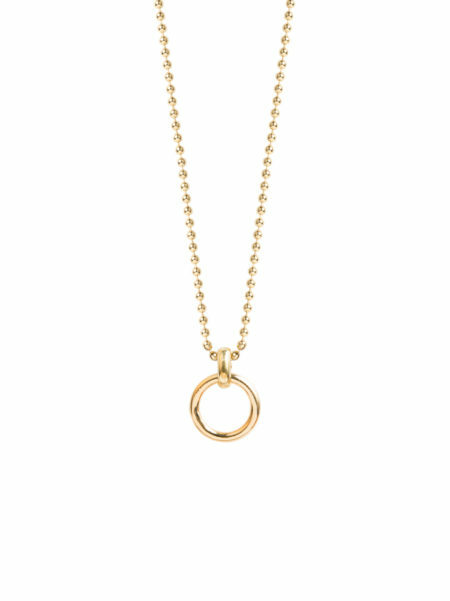 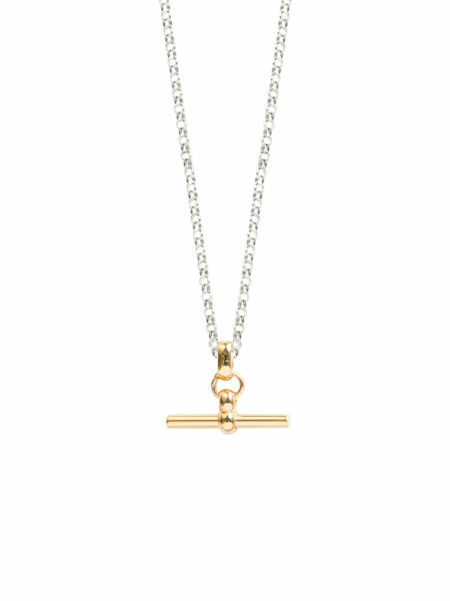 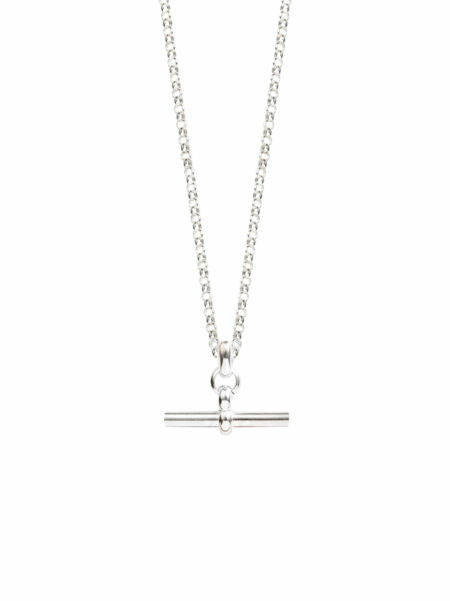 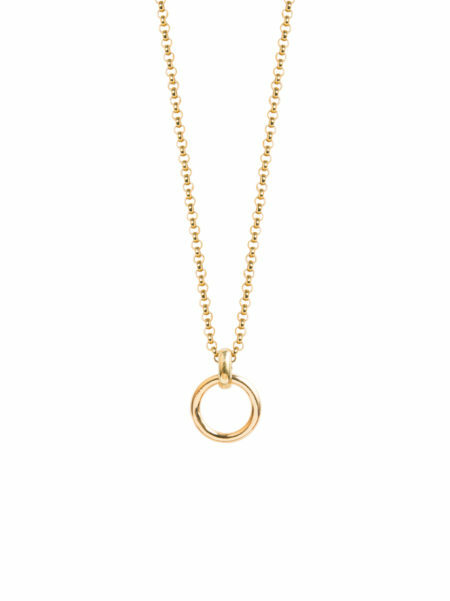 The trace chain has three different layering options within the same chain so it can be worn at either 40cm, 45cm or 50cm. 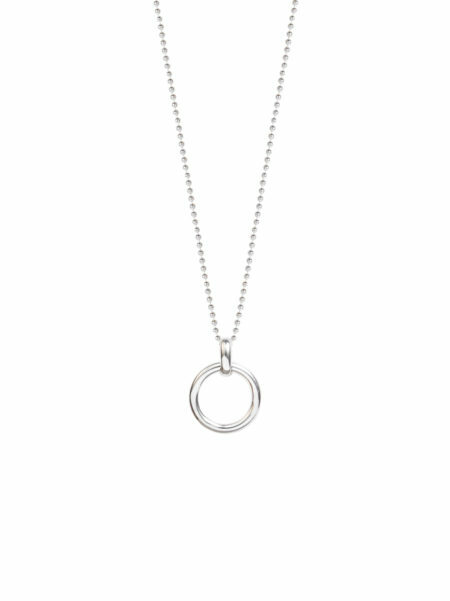 So you can adjust your necklaces depending on your neckline. 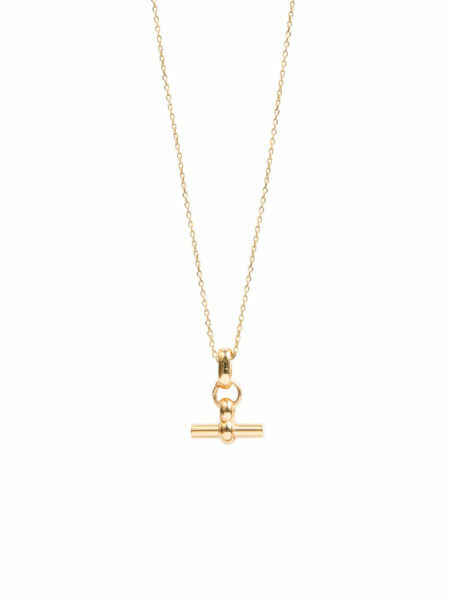 Our magnificent chain necklaces have landed with a luxurious thud. 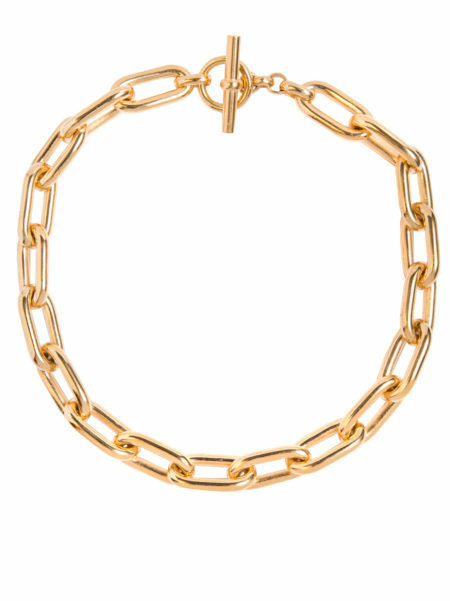 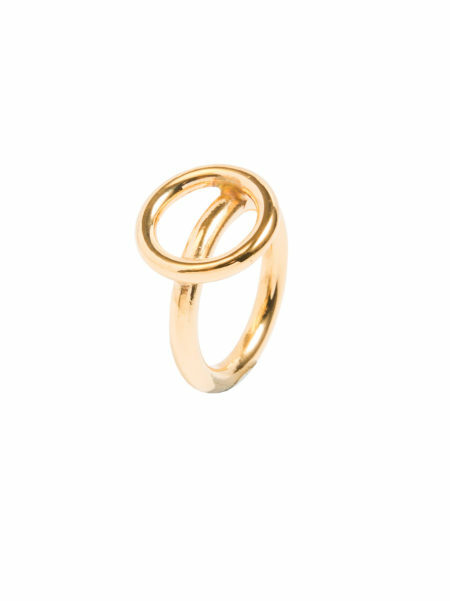 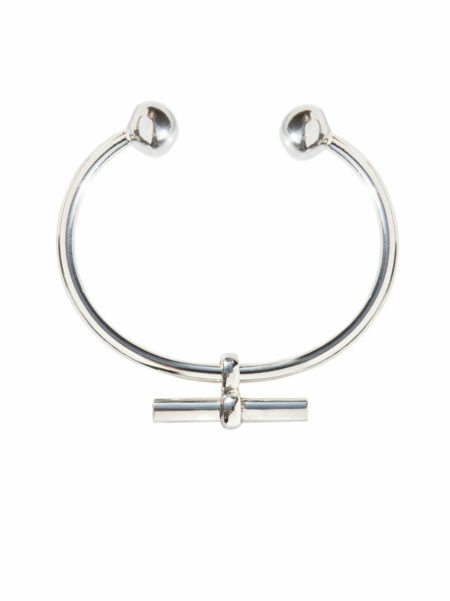 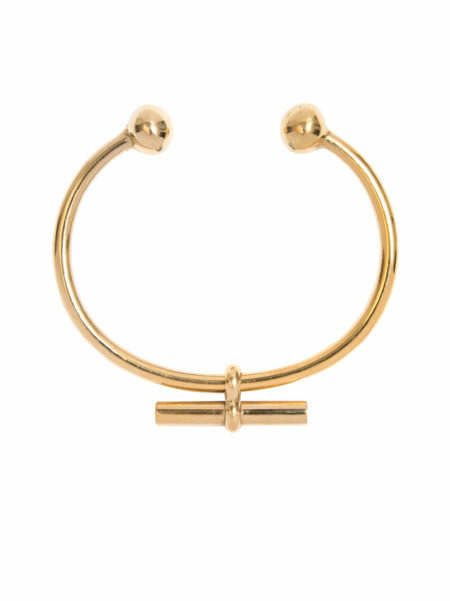 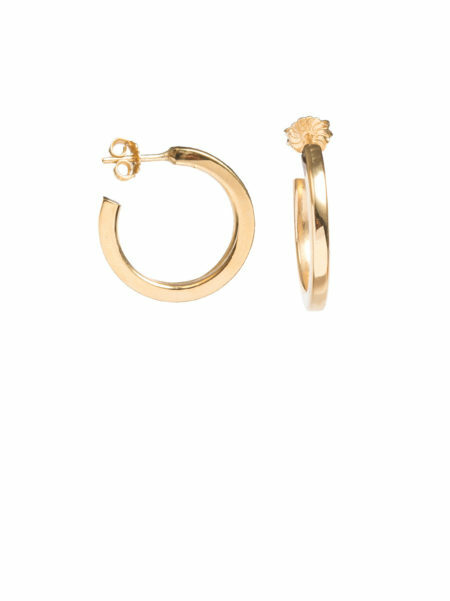 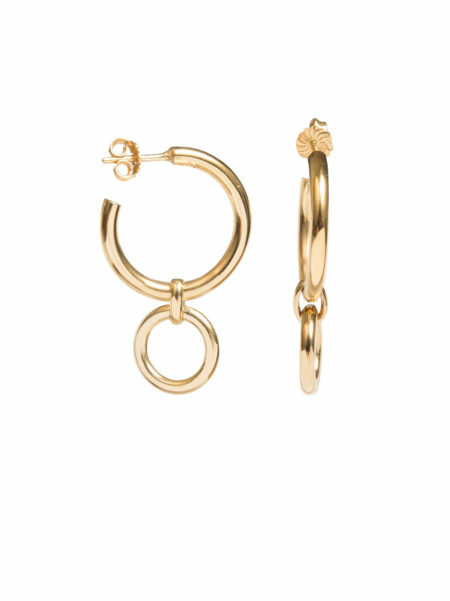 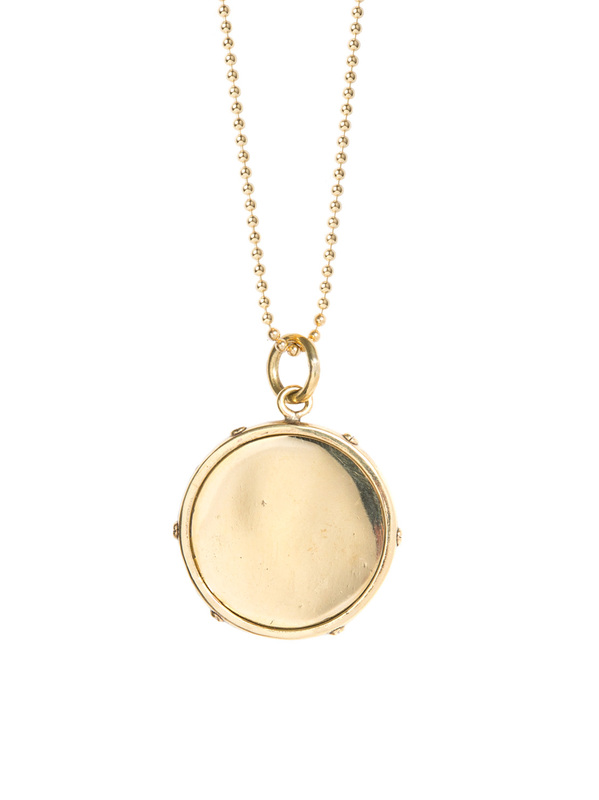 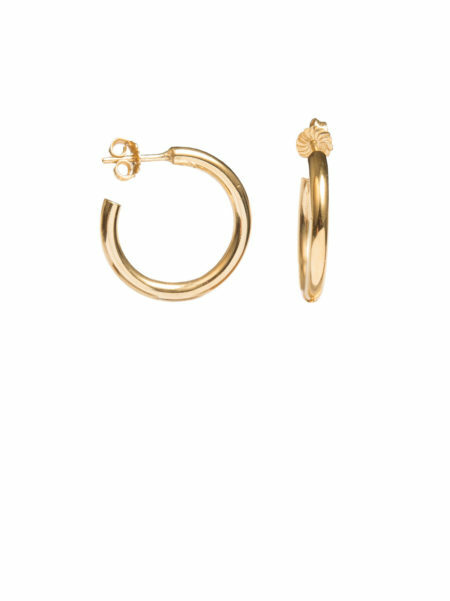 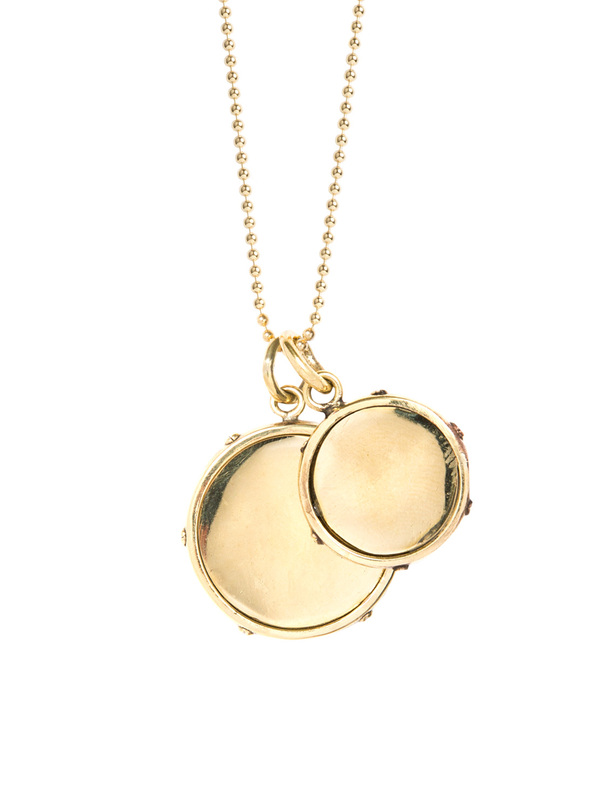 On trend and enviable, this wonderfully weighty and luxurious piece will lift any outfit and give it the edge. 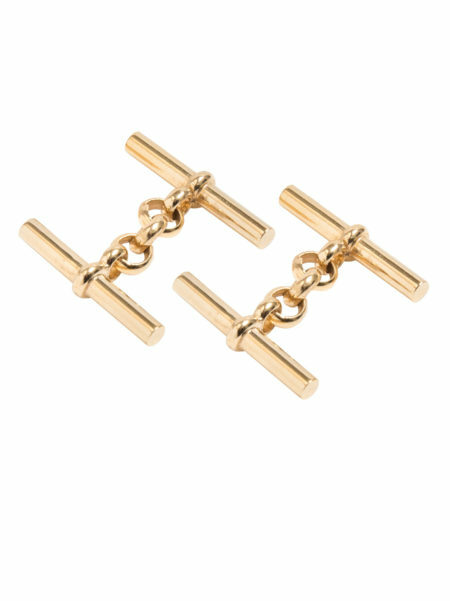 A must-have for any discerning wardrobe. 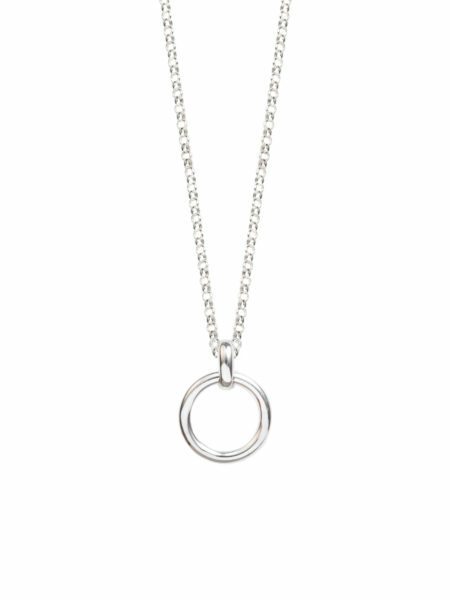 This necklace measures 45cm but with each piece being made to order, its possible to chose your length. 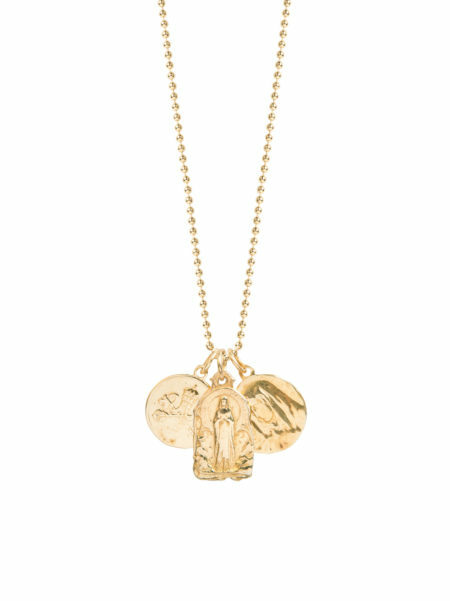 It is hand made in bronze and pated in 2 microns of 18ct gold plate in Birmingham. We guarantee our plating for two years and can always offer a re plating service in the future should you require it. Our magnificent chain necklaces have landed with a luxurious thud. 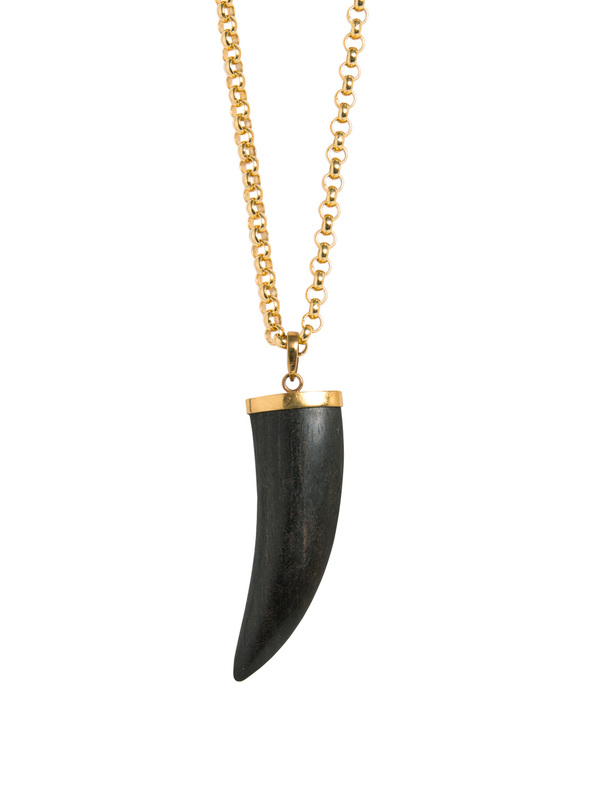 Loud and proud, this bold and beautiful necklace is not for the faint hearted. 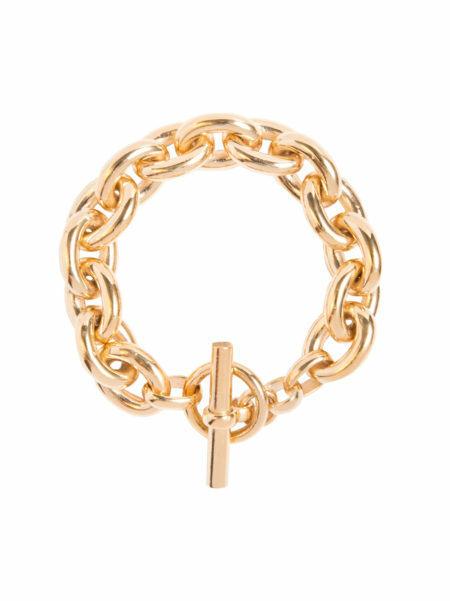 A chic and stylish investment buy, this is a go-to piece that will quickly become a life long friend. 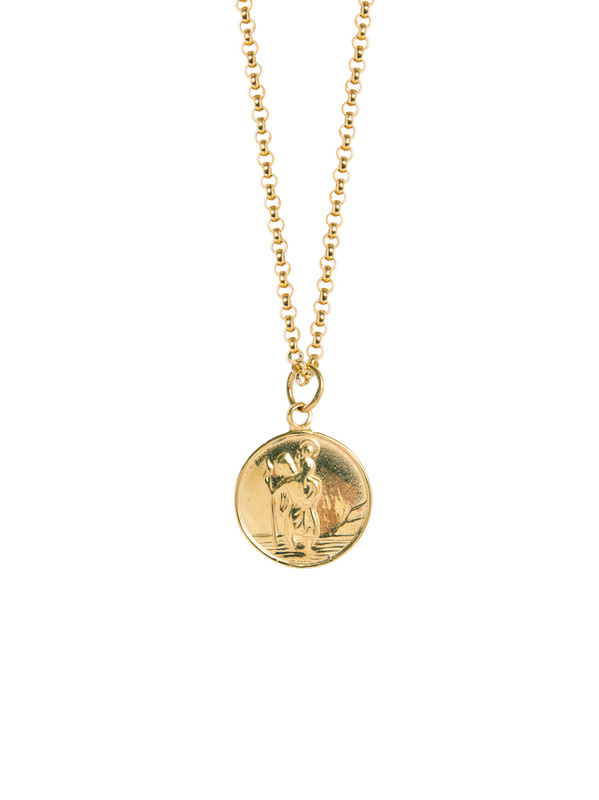 This necklace measures 45cm and has been plated in Birmingham with 2 microns of 18ct gold. 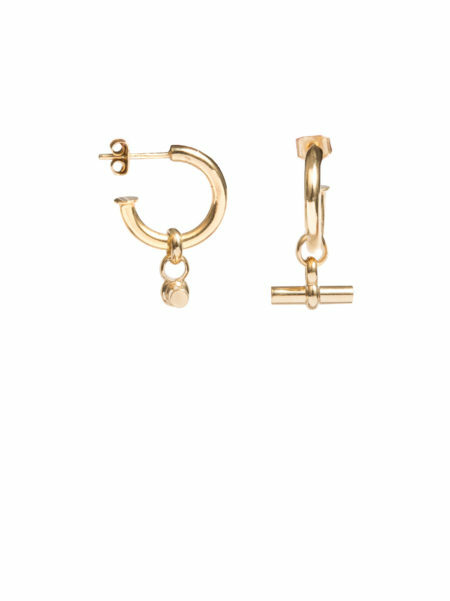 These pieces are all made to order and lead times are approximately three to four weeks.